DENVER — Today I got the next-to-last document I need to apply for a new Chinese work visa. It’s a big relief, and with luck I’ll be back teaching in China after their October National Holiday. This process began after the July 4 holiday and so far has cost me $566 in postage, FedEx charges, application fees, and visa agency services. But the worst part has been the waiting — waiting to receive the documents I sent out, waiting for the final authentications from two Chinese consular offices, waiting to find out if I’ve crossed my T’s and dotted my I’s in the correct fashion. Mind you, I have enjoyed living with my children all summer, and have enjoyed the longest vacation I’ve ever had from working, but the waiting has been driving me a bit bonkers. So I am glad to see the light at the end of the tunnel. To remind you all how I got in this fix, it started in early June, when I was told by the foreign affairs office of Jishou University that Hunan province had lowered the maximum age for foreign teachers from 64 to 60. Despite the contract we had both signed, the university and I would have to part ways. As my residence permit would expire June 30, I had to quickly make arrangements to leave China. Meanwhile, I went searching for a new job, and was offered a position in Zhengzhou, where the maximum working age is still 64. I shipped about 80% of my necessary belongings there, and came back to the USA with two large suitcases, a backpack and a camera bag. Under more leisurely circumstances, we would have merely transferred my work visa and residence permit to the new location. Three weeks was not enough time, however, and I would have to apply for a new work visa once I returned to the USA. In 2008, it was easy as pie to get a work visa from China. You provided a photocopy of your diploma, a medical exam report, a passport-sized mugshot, a preliminary work permit from your Chinese employer, and $75. I had my visa the same day I applied. But China has made the requirements more stringent, a result of too many foreigners forging academic credentials and concealing criminal records. While I was excused from the medical exam — the one I had in May was sufficient — I would still have to observe the new requirements, even though I had worked in China for nine years straight. The diploma has to be verified as a reliable and true document by the college or university and that signature notarized. Then, the notary public’s signature has to be verified by the state (sometimes the county, the state, and the federal government). Then, it needs final authentication from the Chinese consulate. 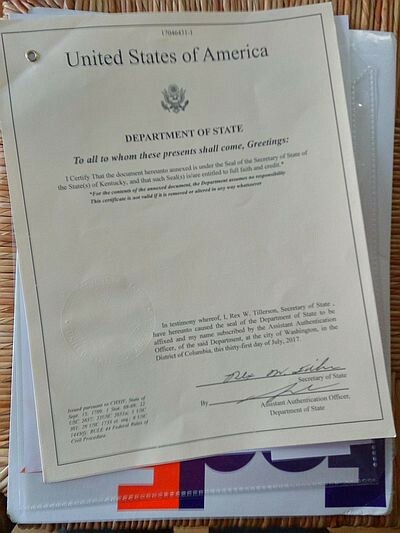 A report showing no criminal record must be signed by the appropriate local or state official, notarized, verified (in my case) by the US Department of State, and then finally authenticated by the Chinese consulate. I even got Rex Tillerson’s signature! In other words, there are several layers of authentications needed: local, state, federal (in some cases), and Chinese consular. It all takes time and money. Another potentially disastrous error could have been the lack of an official signature on the criminal record report, but it turned out not to be a problem. Again, in my haste to get the ball rolling in July, I requested a report from the Kentucky courts system about my record (if any) in the criminal justice system there. There is none. The report had no signature from a court official. I put my signature on it in front of a notary, and took it to the Jefferson County clerk’s office to verify the notary’s commission and signature. Then it went to the state Department of State, and finally to the US Department of State. When I sent it to Visa-Rite, a visa agency, they told me the consulate in Washington, DC, might reject the report, as it lacked that initial signature by an official. They said we could send it to the consulate and hope for the best, or wait until I got a new report which was properly signed. I suggested the first option, pointing out that I had already been working in China for nine years, so it would be unlikely I’d have a criminal record in the USA anyway. I had provided copies of my previous work visa from 2008 and my most recent resident permit, and suggested if the consulate had questions, they could ask the Public Security Bureau in Jishou. The gamble paid off, but in the meantime I was on pins and needles, debating whether I should pay for a 48-hour FBI fingerprint report as a failsafe in case the Kentucky court report was rejected. The consulates received the documents on Sept. 5. The diploma went to the New York consulate, and came back on the 12th. The criminal record report went to the embassy in Washington, and took a week longer. Maybe they’re busier there, or maybe they investigated my activities in China. Whatever the case, I got it back today with their seal of approval. 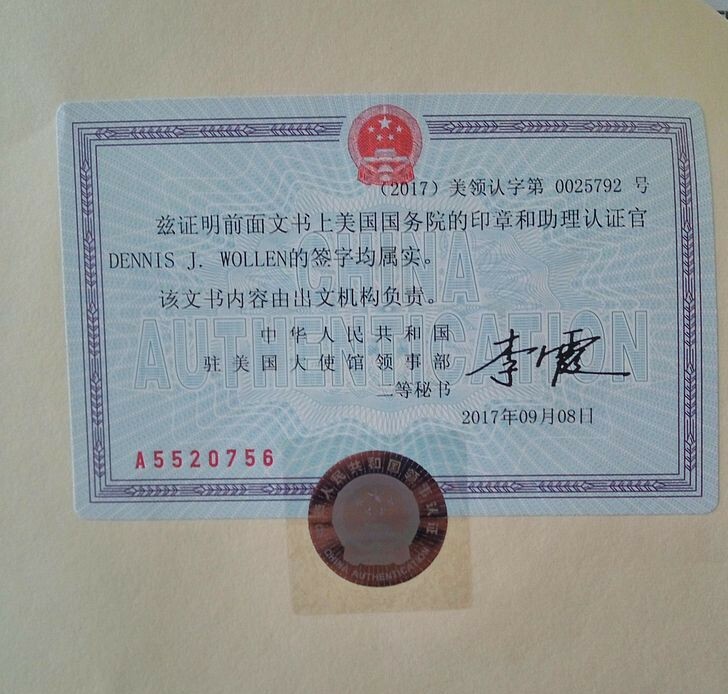 The next step is to email scans of the documents to my employer in Zhengzhou, who will apply for a preliminary work permit for me. They will send it to me, and I will then be able to apply for the work visa. Unlike the last time, I will probably have to wait a few days before it’s ready. Same-day service appears to have ended. Given my troubles with this process, I’ve decided to write it up as a how-to page for other would-be EFL teachers thinking of applying to work in China. I had to visit several different websites before I got a clear idea of the process. Had someone (say, like the Chinese consulate) provided step-by-step instructions, I would have probably made fewer mistakes and gotten my visa a little sooner.